Reference number for this case: 20-Oct-54-Guebwiller. Thank you for including this reference number in any correspondence with me regarding this case. 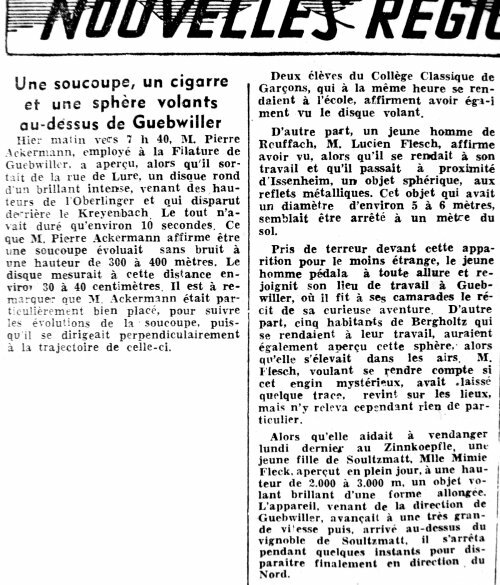 On page 5 of the Mulhouse issue of the regional newspaper L'Alsace for October 21, 1954, several sightings were reported, including this one, on October 20, 1954, at approximately 07:40 a.m.
Pierre Ackermann, employee at the Guebwiller tissue factory, coming out of the street of Lure, had seen "a round disc of an intense brilliance", coming from the height of the Oberlinger, to "disappear" behind the Kreyenbach. The sighting had lasted only about 10 seconds, and there was no noise. Pierre Ackermann stated that it was a flying saucer, and that it had flown at an altitude of 300 to 400 meters, measuring "at that distance about 30 to 40 centimeters." The newspaper commented that Pierre Ackermann was really at the right place "to follow the moves of the saucer, since he was moving perpendicularily to the latter." The newspaper added that two pupils of the Classic Boys College who were going there at the same hour stated they also saw the "flying disc." "In Guebwiller, Mr. Pierre Ackerman stated he saw in the sky a shiny disc that moved silently at about 400 meters of altitude. Two college boys confirmed this statement." Yesterday morning, around 7:40, Mr. Pierre Ackermann, employee at the tissue factory of Guebwiller, saw, while he came out of the street of Lure, a round disc of an intense brilliance, coming from the heights of Oberlinger and which disappeared behind the Kreyenbach. The whole had lasted only approximately 10 seconds. What Mr. Pierre Ackermann states to have been a saucer moved without noise at a height of 300 to 400 meters. The disc measured at this distance approximately 30 to 40 centimetres. It is to be noticed that Mr. Pierre Ackermann was particularly well placed, to follow the evolution of the saucer, since he moved perpendicular to the latter. Terrified in front of this at the very least strange appearance, the young man pedalledat full speed and reached his workplace in Guebwiller, where he told his colleagues about his weird adventure. In addition, five residents of Bergholtz who went to their work, also reprtedly saw this sphere, while it rose in the airs. Mr. Flesch, wanting to check whether this mysterious machine had left some trace, returned to the place, but however found nothing particular there. While she helped pick up the grapes last Monday at the Zinnkoepfle, a girl of Soultzmatt, Miss Mimie Fleck, saw in full day, at a height from 2.000 to 3.000 m, a shining flying object of a lengthened form. The apparatus, coming from the direction of Guebwiller, advanced at a very high speed, then, arrived above the vineyard of Soulztmatt, it stopped during a few moments to finally disappear in direction opf the North. At about 7 h 40, on October 20, Mr. Pierre Ackermann, employee with the Spinning Company of Guebwiller, saw, whereas he came out of the street of Lure, "a round disc of an intense brilliance," coming from the heights of Oberlinger and which disappeared behind Kreyenbach. The whole had lasted only approximately 10 minutes. What Pierre Ackermann claims to have been a saucer evolved without noise at a height from 300 to 400 meters. The disc measured at this distance 30 to 40 cm. Two pupils of the Traditional College boys who at the same hour went to school also affirm to have seen the flying disc. Christian Valentin indicates that on October 20, 1954 to 07:40 a.m., Mr A., an employee of the mill of Guebwiller, saw from its workplace a round amd shining disc which evolved without noise at a height from 300 to 400 meters. The flying disc was also seen by two pupils who were on the way to their high school. Luc Chastan indicates in his database that in the "Haut Rhin (68)" in Guebwiller on October 20, 1954, 07:40 hours, a witness "sees, whereas he came out of the street of Lure, 'a round disc of an intense brilliance,' coming from the heights of Oberlinger and which disappeared behind Kreyenbach. The whole had lasted only approximately 10 minutes. It moved without noise at a height from 300 to 400 meters. The disc measured at this distance 30 to 40 cm. Two pupils of the Collège Classique de garçons [Traditional College for boys] who, at the same hour, went to the school, also said they saw the flying disc." [la1] Article in the regional newspaper L'Alsace, Mulhouse, France, October 21, 1954. [bp1] "C'était en 1954 - Cela fait déjà 50 ans", article on the web page Buhl - Page d'Histoire, at perso.wanadoo.fr/mjc.buhl/Elfaluter/1954.htm. 1.1 Patrick Gross May 27, 2010 Addition [la1]. 1.3 Patrick Gross October 15, 2014 Addition of the Summary. 3.1 Patrick Gross May 11, 2015 Addition [sp4].